Herodian of Antioch, History of the Roman Empire (1961) pp.77-107. Book 3. 1. THE death of Pertinax, the killing of Julianus, the entrance of Severus into Rome, and his expedition against Niger have all been described in the preceding book. When Niger learned that Severus had occupied Rome, had been proclaimed emperor by the senate, and was leading the entire army of Illyricum against him, supported by the rest of the infantry and a naval unit as well, he was greatly disturbed by these unexpected developments. He sent orders to the governors of the Eastern provinces to keep a close guard on all the passes and harbors. 2. He also sent word to the king of the Parthians, to the king of the Armenians, and to the king of the Atrenians, asking for aid. The Armenian king replied that he would not form an alliance with anyone, but was ready to defend his own lands if Severus should attack him now. The Parthian king, on the other hand, said that he would order his governors to collect troops—the customary practice whenever it was necessary to raise an army, as they have no standing army and do not hire mercenaries. 3. Barsemius, king of the Atrenians, sent a contingent of native |78 archers to aid Niger. 4. The rest of his army Niger collected from the troops stationed in those areas. Most of the citizens of Antioch, especially the young men, who, in their instability, were enthusiastic supporters of Niger, offered themselves for military service, acting more in haste than in wisdom. Niger ordered that the narrow passes and cliffs of the Taurus Mountains should be defended by strong walls and fortifications, believing that an impassable mountain range would be a powerful protection for the highways of the East. The Taurus Mountains, which lie between Cappadocia and Cilicia, mark the dividing line between the East and the West. 5. Niger also sent an army to occupy Byzantium in Thrace, at that time a large and prosperous city rich in men and money. Located at the narrowest part of the Propontic Gulf, Byzantium grew immensely wealthy from its marine revenues, both tolls and fish; the city owned much fertile land, too, and realized a very handsome profit from all these sources. 6. Niger wished to have this city under his control because it was very strong, but especially because he hoped to be able to prevent any crossing from Europe and Asia by way of the Propontic Gulf. Byzantium was surrounded by a huge, strong wall of millstones cut to rectangular shape and fitted so skillfully that it was impossible to determine where the courses were joined; the entire wall appeared to be a single block of stone. 7. Even now the surviving ruins of this wall are enough to make the viewer marvel both at the technical skill of the original builders and the might of those who finally destroyed it. Niger was thus acting, as he believed, with the greatest possible foresight to guarantee the utmost security. 1. SEVERUS, in the meantime, pressed on with his army at top speed, halting for neither rest nor refreshment. Having learned that Byzantium, which he knew was defended |79 by the strongest of city walls, had been occupied by Niger, Severus ordered his army to march to Cyzicus. 2. The governor of Asia at that time was the general Aemilianus, to whom Niger had entrusted the military preparations in that province. When he learned that the army of Severus was approaching, Aemilianus marched toward Cyzicus at the head of his entire army, which included both the troops he had enrolled himself and those sent to him by Niger. When the two armies met, savage battles were fought in those regions; the army of Severus conquered, and the soldiers of Niger, put to flight, were routed and slaughtered. Thus the hopes of the East were shattered, while the hopes of the Illyrians soared. 3. There are those who say that Niger's cause, immediately betrayed by Aemilianus, was doomed from the start, and they cite two reasons for that general's action. Some say that the governor plotted against Niger because he was jealous and angry that his successor as governor of Syria was about to become his superior as emperor and tyrant. Others, however, say that he was forced to betray Niger by his own children, who urgently begged him to do so in order to insure their own safety; for Severus, finding Aemilianus' children at Rome, had seized them and was holding them under guard. Nor was he the first to make use of this extremely foresighted stratagem. 4. It was Commodus' practice to keep in custody the children of the governors of the provinces in order to have pledges of their loyalty and good will. Severus, familiar with this practice, when he was made emperor and Julianus was still alive, grew anxious about his children. Sending for them in secret, he had them brought to him from Rome to prevent their falling into the hands of someone else. 5. When he came to Rome, Severus gathered up the children of the governors and those who occupied positions of importance in the East and all Asia and held them in custody; these children he kept so that the governors might be led to |80 betray Niger in fear for the safety of their children, or, if they continued to favor his cause, envisaging the agony they would suffer if their children were killed, they might do something to protect them. 6. After the defeat at Cyzicus, the troops of Niger scattered far and wide; some fled into the mountains of Armenia, others into Galatia and Asia, hoping to reach the Taurus Mountains before the soldiers of Severus and take refuge behind the fortifications there. Meanwhile the army of Severus pressed on, passing through Cyzicus and advancing into neighboring Bithynia. 7. When the report of Severus' victory was made public, dissension immediately arose in the cities of all those provinces, not so much because of affection or good will toward the warring emperors but from mutual jealousy, envy, and hatred, together with indignation over the slaughter of their fellow citizens. 8. This is an ancient failing of the Greeks; the constant organizing of factions against each other and their eagerness to bring about the downfall of those who seem superior to them have ruined Greece. Their ancient quarrels and internal feuds had made them easy prey to the Macedonians and slaves to the Romans, and this curse of jealousy and envy has been handed down to the flourishing Greek cities of our own day. 9. Immediately after these events in Cyzicus, the Nicomedians in Bithynia announced their support of Severus; they sent envoys to him, welcomed his army, and promised to supply all his needs. The Niceans, on the other hand, because they hated the Nicomedians, welcomed the army of Niger, both the fugitives who came to them and the troops sent by Niger to defend Bithynia. 10. Then the soldiers on each side rushed forth from the two cities as if from regular army camps and crashed together; after a savage struggle, the supporters of Severus won a decisive victory. The adherents of Niger who survived the battle fled from |81 those regions and poured into the Taurus Mountains, where they blocked the passes and held the fortifications under guard. But Niger, leaving a force which he considered adequate for the defense of these barricades, hurried off to Antioch to collect troops and money. 1. PASSING through Bithynia and Galatia, the army of Severus swept into Cappadocia; there it halted and put the defense works under siege. This was no small undertaking, however: the narrow rough road made an approach very difficult; and Niger's soldiers, fighting back bravely, stood upon the battlements and hurled stones down on the attackers. 2. Thus a few defenders easily held off a great number of attackers, for the narrow approach was protected on one side by a lofty mountain and on the other by a steep cliff which served as the channel of a waterfall formed by mountain streams. All these natural defenses had been utilized by Niger to block Severus' approach from any direction. 3. While these things were happening in Cappadocia, where mutual jealousy and enmity were general, the Laodiceans in Syria revolted from Niger because they hated the people of Antioch, and the people of Tyre in Phoenicia revolted because they hated the people of Berytus. When they learned that Niger was in headlong flight, the people of these two cities decided to risk stripping him of his honors and publicly proclaimed their support of Severus. 4. Niger learned of this action while he was in Antioch, and although up to this time he had been quite mild, he was now justifiably angered by their insolent defection and sent against them his Moroccan javelin men and some of the archers too, ordering them to kill everyone they met, loot the two cities, and burn them to the ground. 5. The Moroccans are the most brutal and |82 savage men in the world and are wholly indifferent to death or danger. Taking the Laodiceans by surprise, they destroyed the city and slaughtered the inhabitants. Then they hurried on to Tyre and, after much looting and killing, burned the whole city. 1. WHEN he learned what had happened, Niger collected a huge army, but one unused to battle and toil, and marched out in haste. A large number of men, especially the youths of Antioch, presented themselves for service in the campaign, risking their lives for him. The enthusiasm of his army naturally encouraged Niger, but his soldiers were much inferior to the Illyrians in skill and courage. 2. Both armies marched out to a flat, sweeping plain near a bay called Issus; there a ridge of hills forms a natural theater on this plain, and a broad beach slopes down to the sea, as if Nature had constructed a stadium for a battle. 3. It was there, they say, that Darius fought his last and greatest battle with Alexander and was defeated and captured when the West defeated the East.1 Even today a memorial and a monument of the victory remain: a city on the ridge, called Alexandria, and a bronze statue from which the region gets its name. 4. The armies of Severus and Niger not only met at that historic spot but the outcome of the battle was the same. The armies pitched camp opposite each other toward evening, and spent a sleepless night, anxious and afraid. With each of the generals urging his men on, the armies advanced to the attack at sunrise, fighting with savage fury, as if this were destined to be the final and decisive battle and Fortune would there choose one of them as emperor. 5. After the battle had continued for a long time with terrible slaughter, and the rivers which flowed through the plain were pouring more blood than water into the sea, the rout of the forces of the East began. Driving Niger's battered troops before them, |84 the Illyrians forced some of the fugitives into the sea; pursuing the rest as they rushed to the ridges, they slaughtered the fugitives, as well as a large number of men from the nearby towns and farms who had gathered to watch the battle from a safe vantage point. 6. Mounting a good horse, Niger fled with a few companions to Antioch. There he found the survivors of the rout, weeping and wailing, mourning the loss of sons and brothers. Niger now fled from Antioch in despair. Discovered hiding in the outskirts of the city, he was beheaded by the pursuing horsemen [A.D. 194]. 7. Such was the fate Niger suffered, and he paid the penalty he deserved for his negligence and indecision. In other respects, however, they say that he was in no way despicable either as emperor or as man. Having eliminated Niger, Severus now put to death without mercy all the man's friends, whether they had supported him by choice or by necessity. When he learned that some of Niger's soldiers had managed to escape across the Tigris River and that, fearing the emperor, they were joining forces with the barbarians there, he induced a few to return, by granting them full pardon, but the majority of the fugitives remained in that alien land. 1. AFTER settling Eastern affairs in what he thought was the most advantageous way, Severus wished to take the field immediately against the Atrenian king and invade Parthia also, charging both of these kings with friendship for Niger. He put off these projects until later, however, wishing to seize the Roman empire first and make it secure for himself and his sons. 2. Even though Niger had been eliminated, Severus considered Albinus still a menace. He now heard that this man, delighted with the title of Caesar, was acting more and more like an emperor; he was informed also that a great many men, particularly the most distinguished senators, were writing public and private letters to the Caesar, trying to persuade him to come to Rome while Severus was absent and occupied elsewhere. 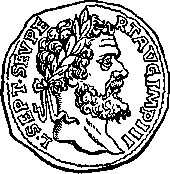 The fact is that the aristocracy much preferred Albinus as emperor because he belonged to a noble family and was reputed to have a mild nature. 3. When he learned of these developments, Severus declined to initiate open hostility against Albinus and start a war with him since he lacked a reasonable excuse for such action. He thought it best to try to eliminate his Caesar by tricking him without warning. 4. He therefore sent his most trusted imperial messengers to Britain with secret orders to hand Albinus the dispatches openly if they were admitted to his presence. They were then to ask him to meet them privately to receive secret instructions; when Albinus agreed to this and his bodyguards were not present, the messengers were to attack him without warning and cut him down. 5. Severus provided them with deadly poisons so that, if the opportunity presented itself, they might persuade one of his cooks or cupbearers to administer a dose in secret. 6. Albinus' advisers, however, were suspicious of the emperor's messengers, |86 and warned him to be on his guard against this cunning schemer. Severus' actions against Niger's governors had seriously damaged his reputation; after forcing them through their children to betray Niger, as has been related above, and after making good use of their assistance, he put them to death with their children after he had got from them everything he wanted. His actions on this occasion clearly revealed Severus' despicable character. 7. The efforts of Severus now led Albinus to increase the size of his bodyguard. None of the emperor's men was admitted into the Caesar's presence until he had first been stripped and searched for concealed weapons. 8. Now when the messengers from Severus arrived, they handed over the dispatches to Albinus openly and asked him to retire with them to receive secret orders. But Albinus, suspicious, had the men seized, and, putting them to torture privately, discovered the entire plot; after killing the messengers, he prepared to resist his revealed enemy. "Let no one charge us with capricious inconsistency in our actions against Albinus, and let no one think that I am disloyal to this alleged friend or lacking in feeling toward him. 2. We gave this man everything, even a share of the established empire, a thing which a man would hardly do for his own brother. Indeed, I bestowed upon him that which you entrusted to me alone. Surely Albinus has shown little gratitude for the many benefits I have lavished upon him. 3. Now |87 he is collecting an army to take up arms against us, scornful of your valor and indifferent to his pledge of good faith to me, wishing in his insatiable greed to seize at the risk of disaster that which he has already received in part without war and without bloodshed, showing no respect for the gods by whom he has often sworn, and counting as worthless the labors you performed on our joint behalf with such courage and devotion to duty. 4. In what you accomplished, he also had a share, and he would have had an even greater share of the honor you gained for us both if he had only kept his word. For, just as it is unfair to initiate wrong actions, so also it is cowardly to make no defense against unjust treatment. Now when we took the field against Niger, we had reasons for our hostility, not entirely logical, perhaps, but inevitable. We did not hate him because he had seized the empire after it was already ours, but rather each one of us, motivated by an equal desire for glory, sought the empire for himself alone, when it was still in dispute and lay prostrate before all. 5. But Albinus has violated his pledges and broken his oaths, and although he received from me that which a man normally gives only to his son, he has chosen to be hostile rather than friendly and belligerent instead of peaceful. And just as we were generous to him previously and showered fame and honor upon him, so let us now punish him with our arms for his treachery and cowardice. 6. His army, small and island-bred, will not stand against your might. For you, who by your valor and readiness to act on your own behalf have been victorious in many battles and have gained control of the entire East, how can you fail to emerge victorious with the greatest of ease when you have so large a number of allies and when virtually the entire army is here. Whereas they, by contrast, are few in number and lack a brave and competent general to lead them. 7. Who does not know Albinus' effeminate nature? Who does not know that his way |88 of life has prepared him more for the chorus than for the battlefield? Let us therefore go forth against him with confidence, relying on our customary zeal and valor, with the gods as our allies, gods against whom he has acted impiously in breaking his oaths, and let us be mindful of the victories we have won, victories which that man ridicules." 1. WHEN it was reported that Severus was not merely threatening to come but would soon appear in person, Albinus was in a state of complete confusion amid the negligence and revelry. Crossing over to the mainland of Gaul opposite Britain, he established his headquarters there. He then sent messages to the governors of the provinces ordering them to provide food and money for his army. Some obeyed and sent supplies, to their own destruction, since they suffered for it later; those who did not obey him saved themselves, more by luck than good judgment. The outcome of the affair and the fortunes of war determined the wisdom of each decision. 2. When the army of Severus came to Gaul, a few minor skirmishes occurred here and there, but the final battle was fought near the large and prosperous city of Lugdunum [Lyon]. Albinus shut himself up in that city, remaining behind when he sent the army out to do battle. A major engagement developed, and for a long time each side's chances of victory were equal, for in courage and ruthlessness the soldiers from Britain were in no way inferior to the soldiers from Illyria. When these two magnificent armies were locked in combat, it was no easy matter to put either one to flight. 3. As some contemporary historians recorded— saying it not to curry favor but in the interests of accuracy —the division of the army stationed opposite the sector where Severus and his command were fighting proved far superior; the emperor slipped from his horse and fled, managing to escape by throwing off the imperial cloak. But while the soldiers from Britain were pursuing the Illyrians, chanting paeans of praise as if they were already victorious, they say that Laetus, one of Severus' generals, appeared with the troops under his command fresh and not yet committed in |90 the battle. 4. The historians accuse Laetus of watching the progress of the battle and deliberately waiting, holding his troops out of the fighting and appearing only after he was informed that Severus had been beaten. The aftermath of the affair substantiates the charge that Laetus coveted the empire himself. Later, when Severus had set everything straight and was living an orderly life, he gave generous rewards to the rest of his commanders, but Laetus alone he put to death, as seems reasonable under the circumstances, considering the general's past performances. 5. All this happened at a much later date, however. On this occasion, when Laetus appeared with fresh troops, as has been related above, Severus' soldiers, taking heart, wrapped the emperor in the imperial cloak again and mounted him on his horse. 6. But Albinus' soldiers, thinking that the victory was theirs, now found themselves in disorder when this powerful and as yet uncommitted army suddenly attacked; after a brief resistance they broke and ran. When the rout became general, Severus' soldiers pursued and slaughtered the fugitives until they drove them into Lugdunum. Each contemporary historian has recorded to suit his own purpose the actual number of those killed and captured on each side. 7. The emperor's troops captured Lugdunum and burned it. When they caught Albinus they cut off his head and sent it to Severus [A.D. 197]. The emperor thus won two magnificent victories, one in the East and one in the West. No battles and no victories can be compared to those of Severus, and no army to the size of his army; there are no comparable uprisings among nations, or total number of campaigns, or length and speed of marches. 8. Momentous indeed were the battles of Caesar against Pompey, when Roman fought Roman; equally momentous were the battles fought by Augustus against Antony and the sons of Pompey, and the struggles of Sulla and Marius at an earlier date, in the Roman civil and foreign wars. But here is one |91 man who overthrew three emperors after they were already ruling, and got the upper hand over the praetorians by a trick: he succeeded in killing Julianus, the man in the imperial palace; Niger, who had previously governed the people of the East and was saluted as emperor by the Roman people; and Albinus, who had already been awarded the honor and authority of Caesar. He prevailed over them all by his courage. It is not possible to name another like Severus. Such was the fate suffered by Albinus, who was stripped of the honor which destroyed him after a brief time. 1. THEN the angry emperor took vengeance upon Albinus' friends at Rome. He sent the man's head to the city and ordered that it be displayed. When he reported his victory in dispatches, he added a note stating that he had sent Albinus' head to be put on public view so that the people might know the extent of his anger against them. 2. After settling affairs in Britain, he divided this region into two provinces, each under its own governor.2 When he had also arranged matters in Gaul in what he considered the most advantageous way, he put all the friends of Albinus to death and confiscated their property, indifferent to whether they had supported the man by choice or by necessity. He then took his entire army to Rome in order to inspire the utmost terror there. 3. When he had completed the journey at his usual rapid pace, he entered Rome, raging at Albinus' surviving friends. The citizens, carrying laurel branches, welcomed him with all honor and praise; the senate also came out to greet him, most of them standing before him in abject dread, convinced that he |92 would not spare their lives. Since his malevolence, a natural character trait, was deadly even when he had little provocation, now that he seemed to have every reason to treat them harshly, the members of the senate were terror-stricken. 4. After visiting the temple of Jupiter and offering sacrifices in the rest of the shrines, Severus entered the imperial palace. In honor of all his victories he made generous gifts to the people; distributing large sums of money to the soldiers, he granted them many privileges which they had not previously enjoyed. 5. He was the first emperor to increase their food rations, to allow them to wear gold finger rings, and to permit them to live with their wives; these were indulgences hitherto considered harmful to military discipline and the proper conduct of war. Severus was also the first emperor to make a change in the harsh and healthy diet of the soldiers and to undermine their resolution in the face of severe hardships; moreover, he weakened their strict discipline and respect for their superiors by teaching them to covet money and by introducing them to luxurious living. 1. SEVERUS now remained in Rome for a long time, during which his sons were partners with him in governing the empire. He was then seized with a desire to win glory for victories not only over fellow countrymen and Roman armies but also barbarians; using as an excuse for his action the friendship shown to Niger by Barsemius, king of the |94 Atrenians, he led his army off to the East. 2. When he arrived there his intention was to invade Armenia also. But the king of the Armenians forestalled him by sending money, gifts, and hostages to support his plea for peace and by promising pacts and good will. After affairs in Armenia had thus turned out to his satisfaction, Severus marched against the Atrenian kingdom. At this time Abgarus, the Osroenian king, fled to Severus and gave him his children as a guaranty of his support; he also brought a great number of archers to fight in the Roman army. 3. After passing through the region between the Tigris and Euphrates rivers and the country of the Adiabenes, Severus hurried on into Arabia Felix, the country which produces the fragrant plants we use in our perfumes and incense. When he had destroyed many towns and villages there and had plundered the countryside, he came into the territory of the Atrenians, where he encamped and laid siege to the city of Hatra. 4. This city, located on top of a lofty mountain, was surrounded by a high, strong wall manned by many bowmen. After making camp, Severus' soldiers pressed the siege with all the power at their command, endeavoring to capture the city. Engines of every type were brought up to the wall, and all the known tactics were tried. 5. The Atrenians fought back bravely; pouring down a steady stream of stones and arrows, they did considerable damage to the army of Severus. Making clay pots, they filled them with winged insects, little poisonous flying creatures. When these were hurled down on the besiegers, the insects fell into the Romans' eyes and on all the unprotected parts of their bodies; digging in before they were noticed, they bit and stung the soldiers. 6. The Romans found the air at Hatra intolerable, stifling from the hot sun; they fell sick and died, and more casualties resulted from disease than from enemy action. 7. When the army, for the reasons mentioned above, had |95 abandoned all hope and the siege was at a stalemate, with the Romans losing instead of gaining ground, Severus led his troops away unsuccessful, fearing that he would lose his entire army.5 The soldiers were unhappy that the siege had not turned out as successfully as they wished; 8. accustomed to victory in all their battles, they believed that failure to win was actually defeat. But Fortune, by furthering his affairs at this time, provided Severus a measure of consolation; he did not return home without some success, and the truth is that he accomplished more than he had expected. 9. The army, sailing in a large number of ships, was not borne to its intended destination on Roman-held shores, but after the current had carried the fleet a great distance, the legions disembarked on Parthian beaches at a spot within a few days' march of the road leading to Ctesiphon, where the royal palace of the Parthians was located. There the king was spending his time peacefully, thinking that the battles between Severus and the Atrenians were no concern of his. 10. But the troops of the emperor, brought by the current to these shores against their will, landed and plundered the region, driving off for food all the cattle they found and burning all the villages as they passed. After proceeding a short distance, they stood at the gates of Ctesiphon, the capital city of the great king Artabanus. 11. The Romans fell upon the unsuspecting barbarians, killing all who opposed them. Taking captive the women and children, they looted the entire city. After the king fled with a few horsemen, the Romans plundered the treasuries, seized the ornaments and jewels, and marched off. 12. Thus, more by luck than good judgment, Severus won the glory of a Parthian victory. And since these affairs turned out more successfully than he had any reason to hope, he sent dispatches to the senate and the people, extolling his exploits, and he had paintings of his battles and victories |96 put on public display. The senate voted him the titles formed from the names of the conquered nations, as well as all the rest of the usual honors. 1. WHEN he had settled affairs in the East, Severus returned to Rome, bringing with him his sons, who were then about eighteen years of age. On the journey he handled provincial problems as each situation demanded, and paid a visit to the troops in Moesia and Pannonia. His trip completed, he was welcomed as "Conqueror" by the Roman people with extravagant praise and adoration. 2. He then staged wild-animal shows for the people and celebrated, with merrymaking, holidays, festivals, and spectacles. After distributing lavish gifts and observing the customary festivities associated with a triumph, Severus remained in Rome for a number of years, presiding regularly in the courts, attending to civil matters, seeing to his sons' education, and keeping the youths under control. 3. But the lads (for they were already young men) were corrupted by the luxury and vice in Rome and by their boundless enthusiasm for shows, dancing, and chariot-driving. The two brothers were contentious from the beginning; as children they had been rivals over quail fights and cockfights, and had had the usual childish quarrels. 4. Now their passion for shows and concerts made them constant competitors. Their followers and companions kept them at odds by fawning upon them and urging them to compete in enjoying youthful pleasures. When he was informed of this, Severus tried to reconcile his sons and keep them in hand. 5. Before his admission to the imperial ruling company, the elder son had the name Bassianus, but when he had the good fortune to receive the honor of a share in the imperial power, |97 Severus called the youth Antoninus,6 wishing him to bear the name of Marcus. He also gave him a wife in the hope that marriage would mature him somewhat; the girl was the daughter of Plautianus, the praetorian prefect. 6. As a youth this Plautianus had been a poor man (some say he was banished after being convicted of treason and many other crimes), but he was a fellow countryman of the emperor (Severus was also from Libya) and, as some say, he was related to the emperor; there are those too who charge him with being something worse, saying that when he was in the prime of youth he was the emperor's beloved. Consequently, Severus raised the man from a position of small and negligible honor to a post of great authority; by giving him the property of condemned men, he made Plautianus enormously wealthy. The emperor in fact shared the rule with no one except this man. 7. Taking advantage of his authority, Plautianus left no act of violence undone and thus became more feared than any of the prefects before him. Severus united the two families by the marriage of his son to the daughter of Plautianus. 1. OBSERVING that Severus was now old and constantly racked by disease, while Caracalla was a rash and reckless youth, Plautianus, in fear of these threats, elected to act first rather than to delay and suffer at his son-in-law's hands. 2. Moreover, a number of things encouraged him to aspire to control of the empire: more money than anyone had ever seen before, his own personal army,7 honors from the emperor, and his public attire. He wore the toga with the purple border and held rank equal to that of men who had twice served as consul; also he wore a sword. The prefect was the only official whose appearance suggested his importance. 3. He was an object of dread when he appeared in public; not only did no one approach him, but even those who came upon him by chance turned aside to avoid him. The guards who preceded him did not allow anyone to stand near or to stare at him; all were ordered to step aside and keep their eyes fixed on the ground. Severus was far from pleased when these matters were brought to his attention; he now became stern and harsh with Plautianus and tried to curb his excessive ostentation by depriving him of some of his authority. 4. Plautianus refused to tolerate this reduction of power; bold enough to plot for the empire, he devised the following plan. In the Praetorian Guard was a tribune named Saturninus. This officer was devoted to the prefect; in fact, all his officers were devoted to Plautianus, but he had won the favor of the tribune by treating him with greater affection. Believing that Saturninus was the most trustworthy of the praetorian officers and the only one capable of using discretion and of carrying out secret orders, Plautianus summoned the man to him one |99 evening after the rest had gone to bed. 5. "Now you have an opportunity," he said, "to bring to a proper climax the good will and devotion you have always shown me, and I equally have an opportunity to repay you as you deserve and do you a comparable favor in return. The choice is yours either to become what you now see me to be and to secure this office of authority by succeeding me, or to die here and now, paying the penalty for disobedience. 6. Do not by any means be overawed by the enormity of the deed I propose, and do not be disturbed by the title of emperor. You are the only one who can go into the room where the emperor and his son are sleeping, since you are in charge of the regular rounds of the night unit of the guard. Whatever you intend to do, you will do secretly and without interference; do not wait for me to issue the orders before you obey them. 7. Go immediately to the imperial palace and, pretending to be carrying secret orders from me, go in and kill them. Show your courage by dispatching with ease an old man and a mere boy. And for sharing the risk and the danger, you will also share the highest honors when the deed is successfully done." 8. The tribune was astounded and perplexed by this proposal, but he was a man accustomed to keeping his wits about him (he was a Syrian, and the men from the East are rather more cunning in their thinking); observing the fury which gripped his commanding officer and well aware of his power, he did not oppose him, not wishing to be killed over these matters. Pretending therefore to be hearing things long prayed for and warmly welcomed, the tribune prostrated himself before Plautianus as if he were already emperor and begged him for a written memorandum ordering the murder. 9. If a man were condemned to death without a trial, the tyrants customarily put the order in writing so that the sentence might not be carried out solely on verbal authority. Blinded by his ambition, Plautianus gave the tribune a directive in |100 writing and sent him off to commit the murders. He further ordered Saturninus, after killing the emperor and his son, to summon him, before the deed became known, that he might be in the palace before anyone realized that he was seizing the empire. 1. AGREEING to those proposals, the tribune made his customary rounds through the entire imperial palace without interference. But knowing that it would be impossible for him to kill two emperors, especially since they were housed in different parts of the palace, Saturninus stood outside the bedroom of Severus and, summoning the imperial household guards, demanded to be taken to the emperor so that he might give him information involving his safety. The guards reported the matter to Severus and were ordered to bring the tribune before him. 2. The tribune approached the emperor and said: "I have come to you, Master, as the man who sent me well knows, to be your assassin and murderer, but I hope and pray that I will be instead your benefactor and savior. Plautianus, scheming to seize the empire, ordered me to murder you and your son, and he issued this order not in words alone but in writing. This memorandum is my witness. I undertook the assignment because I was afraid that if I refused it he would entrust the task to someone else, and I have come here to disclose these matters to you so that his intrigues may not remain undetected." 3. But even though Saturninus made these charges with much weeping, Severus was not immediately convinced. On the contrary, since he had great affection for the prefect, he suspected that the affair was a trick of some sort to deceive him; he believed that his son, in his hatred of the prefect and his daughter, had contrived a slanderous and fatal plot against |101 the man. 4. The emperor therefore sent for his son and reprimanded him for having devised such a scheme against a man kindly disposed toward the emperor and his intimate friend as well. At first Caracalla swore on his honor that he knew nothing about what the tribune was saying; but when the man insisted and produced the memorandum, the young emperor encouraged him, urging him to prove the truth of his charges. Realizing his danger and fearing the emperor's affection for Plautianus, the tribune now knew that if the plot remained confused and unproved, he could expect a death that would not be accidental. 5. "Master," he said, "do you wish stronger proof or clearer evidence of some sort? Then allow me to go to the front of the palace and reveal to one of the men loyal to me that the murder is done. Trusting me, Plautianus will come here in the belief that he is occupying the deserted palace. When he arrives, it will be your task to discover the truth. Order complete silence about the palace so that the plan may not be upset by being previously discovered." 6. After making this proposal, the tribune ordered one of his most trusted men to carry a message to the prefect telling him to come to the palace as quickly as possible. The messenger was to say that both emperors were dead, and it was imperative that the prefect be inside the palace before the news was reported to the people. Then, with the Palatine Hill in his hands and the succession already settled, all the Romans, willingly or unwillingly, would offer allegiance not to an emperor to be chosen but to one already established. 7. Believing this message, and with high hopes, Plautianus, though it was late at night, put on a breastplate beneath his robe for protection, mounted a chariot, and drove to the palace at top speed, accompanied by a few friends who were with him when the messenger came and who thought that he had received an emergency summons from the emperors. 8. Plautianus entered the palace unchallenged, since the guards were unaware of what was taking place. The tribune came forward to meet the prefect and set a trap for him: saluting Plautianus as emperor and taking him by the hand in the customary fashion under the circumstances, Saturninus led him into the bedroom where he said the bodies of the emperors had been thrown. 9. Severus had already alerted some of the younger bodyguards to seize the prefect as he entered the room. Then Plautianus, who had expected a far different reception, was caught and held fast. When he saw both emperors standing before him, he was terror-stricken, and pleaded with them, trying to defend himself and swearing that it was all a mistake, a plot, a conspiracy against him. "How would you explain these two facts? 11. First, that you came unordered to your emperors at night, and second, that you came here wearing that breastplate ? Who goes to a feast or a revel in full armor?" After saying this, Caracalla ordered the tribune and the other praetorians present to draw their swords and kill this proven enemy. 12. Obeying without delay the young emperor's orders, they killed Plautianus and threw his body into the street, so that the affair might be clear to all and he would be vilified by those who despised him. 1. AFTER this time, Severus appointed two praetorian prefects. The emperor passed most of the remainder of his life on the imperial estates near the city and along the coast of Campania, presiding in the courts and attending to imperial affairs. He wished to keep his sons away from the luxury at Rome and wanted them to have the benefits of a wholesome life, especially when he observed that they were taking far more interest in shows than was proper for those of imperial rank. 2. Because of their enthusiasm for these pastimes and the rivalry which kept them at odds and openly hostile, the brothers were in a constant state of turmoil, strife, and enmity. Caracalla became especially intolerable after he had removed Plautianus. Respect for his father and fear of him kept the youth from taking drastic action, but he plotted death in every form for his wife, Plautianus' daughter. 3. Severus, however, sent the girl and her brother to Sicily, providing them with sufficient funds to live in comfort there. In doing this he was following the example of Augustus, who treated Antony's children in this way even though Antony was his enemy. Severus tried constantly to reconcile his sons and persuade them to live in peace and harmony. He kept reminding them of tales and plays of old, telling them time and again of the misfortunes suffered by royal brothers as a result of dissension. 4. He showed them the treasuries and temples, overflowing with riches; he made it clear that they would never have to scheme abroad for money and power; resources at home were so plentiful that they could pay the soldiers with lavish generosity. The garrison at Rome had been quadrupled,8 and the army encamped |103 before the city was so powerful that there remained no foreign army strong enough to rival it in number of troops, in physical prowess, or in the amount of money available for pay. 5. He told them, however, that all these were of no advantage to them as long as they remained hostile to each other and friction continued between them. By saying such things at every opportunity, now pleading, now rebuking, Severus tried to keep his sons under control and bring them into agreement. But the youths paid absolutely no attention to him; they rebelled and spent their time in pursuits even more reprehensible. 6. Since they were vigorous youths and their imperial authority gave them an insatiable appetite for pleasures, each had his own group of loyal followers; these not only gratified the youths' desires and their enthusiasm for disgraceful practices, but they also constantly found new vices to bring pleasure to their favorite and chagrin to his brother. But Severus punished these parasites whenever he caught them performing such services. 1. IN THE midst of the emperor's distress at the kind of life his sons were leading and their disgraceful obsession with shows, the governor of Britain informed Severus by dispatches that the barbarians there were in revolt and overrunning the country, looting and destroying virtually everything on the island. He told Severus that he needed either a stronger army for the defense of the province or the presence of the emperor himself. 2. Severus was delighted with this news: glory-loving by nature, he wished to win victories over the Britons to add to the victories and titles of honor he had won in the East and the West. But he wished even more to take his sons away from Rome so that they might settle down in the soldier's life under military discipline, far from the |104 luxuries and pleasures in Rome. And so, although he was now well advanced in years and crippled with arthritis, Severus announced his expedition to Britain, and in his heart he was more enthusiastic than any youth. 3. During the greater part of the journey he was carried in a litter, but he never remained very long in one place and never stopped to rest. He arrived with his sons at the coast sooner than anyone anticipated, outstripping the news of his approach. He crossed the channel and landed in Britain; levying soldiers from all these areas, he raised a powerful army and made preparations for the campaign. 4. Disconcerted by the emperor's sudden arrival, and realizing that this huge army had been assembled to make war upon them, the Britons sent envoys to Severus to discuss terms of peace, anxious to make amends for their previous errors. 5. Seeking to prolong the war so as to avoid a quick return to Rome, and still wishing to gain a victory over the Britons and the title of honor too, Severus dismissed the envoys, refusing their offers, and continued his preparations for the war. He especially saw to it that dikes were provided in the marshy regions so that the soldiers might advance safely by running on these earth causeways and fight on a firm, solid footing. 6. Most of the regions of Britain are marshy, since they are flooded continually by the tides of the ocean; the barbarians are accustomed to swimming or wading through these waist-deep marsh pools; since they go about naked, they are unconcerned about muddying their bodies. 7. Strangers to clothing, the Britons wear ornaments of iron at their waists and throats; considering iron a symbol of wealth, they value this metal as other barbarians value gold. They tattoo their bodies with colored designs and drawings of all kinds of animals; for this reason they do not wear clothes, which would conceal the decorations on their bodies. 8. Extremely savage and warlike, they are armed only with a spear and a |105 narrow shield, plus a sword that hangs suspended by a belt from their otherwise naked bodies. They do not use breastplates or helmets, considering them encumbrances in crossing the marshes. For all these reasons, Severus prepared whatever he thought would be of advantage to the Roman army and whatever would harass the barbarians and hamper their attacks. 9. When it seemed to him that all was in readiness for the campaign, Severus left the younger of his two sons, Geta, in the section of the province under Roman control; he instructed him to administer justice and attend to imperial affairs, leaving with him as advisers his more elderly friends. Then, accompanied by Caracalla, the emperor marched out against the barbarians. 10. After the troops had crossed the rivers and the earthworks which marked the boundary of the Roman empire in this region,9 frequent battles and skirmishes occurred, and in these the Romans were victorious. But it was easy for the Britons to slip away; putting their knowledge of the surrounding area to good use, they disappeared in the woods and marshes. The Romans' unfamiliarity with the terrain prolonged the war. 1. NOW a more serious illness attacked the aged emperor and forced him to remain in his quarters; he undertook, however, to send his son out to direct the campaign. Caracalla, however, paid little attention to the war, but rather attempted to gain control of the army. Trying to persuade the soldiers to look to him alone for orders, he courted sole rule in every possible way, including slanderous attacks upon his brother. 2. Considering his father, who had been ill for a |106 long time and slow to die, a burdensome nuisance, he tried to persuade the physicians to harm the old man in their treatments so that he would be rid of him more quickly. After a short time, however, Severus died, succumbing chiefly to grief, after having achieved greater glory in military affairs than any of the emperors who had preceded him. 3. No emperor before Severus won such outstanding victories either in civil wars against political rivals or in foreign wars against barbarians. Thus Severus died [A.D. 211] after ruling for eighteen years, and was succeeded by his young sons, to whom he left an invincible army and more money than any emperor had ever left to his successors. 4. After his father's death, Caracalla seized control and immediately began to murder everyone in the court; he killed the physicians who had refused to obey his orders to hasten the old man's death and also murdered those men who had reared his brother and himself because they persisted in urging him to live at peace with Geta. He did not spare any of the men who had attended his father or were held in esteem by him. 5. He undertook secretly to bribe the troop commanders by gifts and lavish promises, to induce them to persuade the army to accept him as sole emperor, and he tried every trick he knew against his brother. He failed to win the backing of the soldiers, however, for they remembered Severus and knew that the youths had been one and the same to him, and had been reared as equals from childhood; consequently they gave each brother the same support and loyalty. 6. When the soldiers refused to uphold him, Caracalla signed a treaty with the barbarians, offering them peace and accepting their pledges of good faith. And now he abandoned this alien land and returned to his brother and mother. When the boys were together again, their mother tried to reconcile them, as did also men of repute and the friends of Severus who were their advisers. 7. Since all these opposed his wishes, Caracalla, |107 from necessity, not from choice, agreed to live with Geta in peace and friendship, but this was pretended, not sincere. Thus, with both of them managing imperial affairs with equal authority, the two youths prepared to sail from Britain and take their father's remains to Rome. After burning his body and putting the ashes, together with perfumes, into an alabaster urn, they accompanied this urn to Rome and placed it in the sacred mausoleum of the emperors.10 8. They now crossed the channel with the army and landed as conquerors on the opposite shore of Gaul. How Severus came to the end of his life and how his sons succeeded him in the imperial power, I have described in this book. 1. 1 Herodian is in error on all points here. Issus was neither the last nor the most decisive battle in the Persian campaign, and Darius was never captured alive by Alexander. 2. 2 The army of Britain—three legions—was too large to be entrusted safely to the command of one governor. It was Severus' general policy to allow no governor of a province more than two legions. 3. 3 The Eleusinian Mysteries are the most famous of these orgiastic rites celebrated in secret in honor of Demeter and Dionysus. 4. 4 The saeculum, the longest span of human life, was fixed for the games of Severus in 204 as one hundred ten years. 5. 5 Hatra also successfully withstood a siege by Trajan. Cf. Dio 75.31.1-4. 6. 6 I have regularly substituted the more familiar "Caracalla" for Herodian's "Antoninus." 7. 7 The Praetorian Guard. 8. 8 Almost surely an exaggeration. Severus did not increase the number of praetorian cohorts and added only one urban cohort. 9. 9 The turf wall from the Firth of Forth to the Firth of Clyde built by Antoninus Pius in 142. 10. 10 The tomb of Hadrian beside the Tiber River. This text was transcribed by Roger Pearse, Ipswich, UK, 2007. All material on this page is in the public domain - copy freely.